It is not that easy to be on a Spring Green Diet. To eat A LOT OF greens we need to have A LOT OF greens recipes. Smoothies became the most popular way to incorporate greens in our diet today. I cannot tell I am fond of them. Being very practical and easy to make, to me, they lack the most important component of food – TASTE. Traditional cuisines have much better options. And many of them do not require high cooking skills either. Pkhali is an amazing spring and summer dish. It comes from the traditional Georgian cuisine. I do not mean the state of Georgia, rather Georgia the country. It is situated in Caucasian Mountains region and is famous for its remarkable people, wine, unique cuisine tradition and record long natural longevity. In a food processor almost puree walnuts, garlic, parsley, cilantro, fenugreek, hot paprika. Bring a large pot of salted water to boil. Add thoroughly washed spinach. Cook for half a minute, or just until wilted. Strain, rinse with cold water and squeeze as much water out as possible. You may either process spinach in a food processor, or finely chop it (I am chopping, of course). 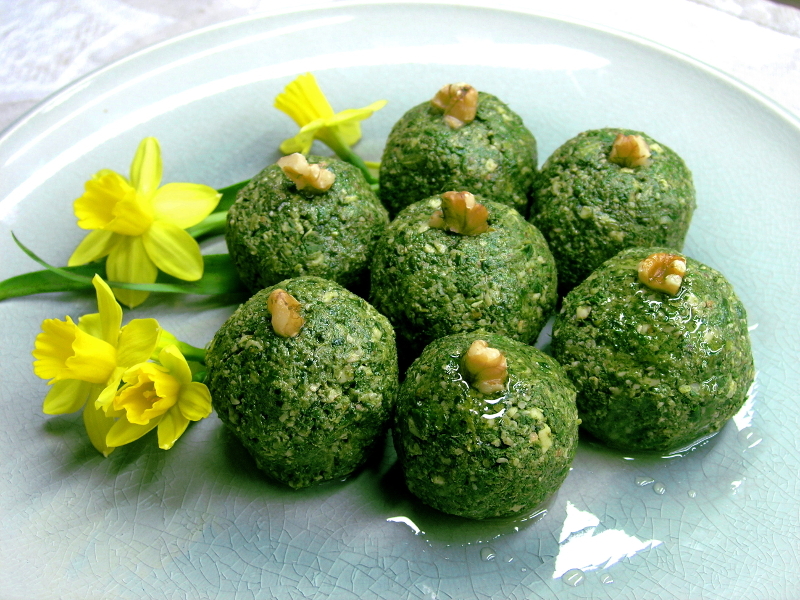 Combine nut mixture with spinach, salt to taste and sprinkle with freshly squeezed lemon juice. Mix and leave overnight in a fridge to let all the flavours combine (you may skip this step, if you wish). Roll bite size balls or eat it as a spread on sour-dough rye bread with fresh cheese. Final touch: sprinkle Pkhali with a bit of roasted walnut oil just before serving. OH! It is so good, you would easily finish it in one day. No wonder many Georgian people live over 100 year old.